Standards-based grading (SBG) is the new approach to grading that focuses on learning goals rather than overall average grade. Are you a teacher on the fence about standards-based grading? I’ve rounded up a few blog posts from teachers practicing SBG in hopes you’ll join us on the standards-based side of things. They discuss what’s working, the atmosphere, and things to keep in mind when transitioning. Like anything that’s worth the time, it requires some effort in a beginning until things become systematic. Take a look at these teachers of SBG classrooms to learn how you could start standards-based grading in your classroom. Let’s agree that we’re not all experts in everything. I don’t have any delusions of being able to set a broken arm or of being able to parse a land title, so please allow educators the latitude that there may be some unintuitive methods to their craft. Also, let’s put the work-school analogies to bed. If schools were operated like businesses, we’d fire all of the needy students. If these sound like ideas you can get behind, read on. If you like your current, points-based system, read on too, because you’ll feel justified in a little bit. Then I started stalking found Dan Meyer and developed a huge crush Are you single? and all of a sudden I knew what I wanted my classroom to look like. No student-initiated reassessments. WHY: This actually wasn’t my rule, but I was lucky if these students showed up to class in the first place. No one came to extra help or during a free period to reassess. So I just put the most missed standards on subsequent quizzes. It worked out fine and I didn’t have kids hounding me for reassessments when the term ended. Keep it simple. Let’s always record a student’s most recent evidence of proficiency and stop averaging prior to proficient practice with recent learning. We want all students to find their highest level of proficiency. Looking for more standards-based learning support? 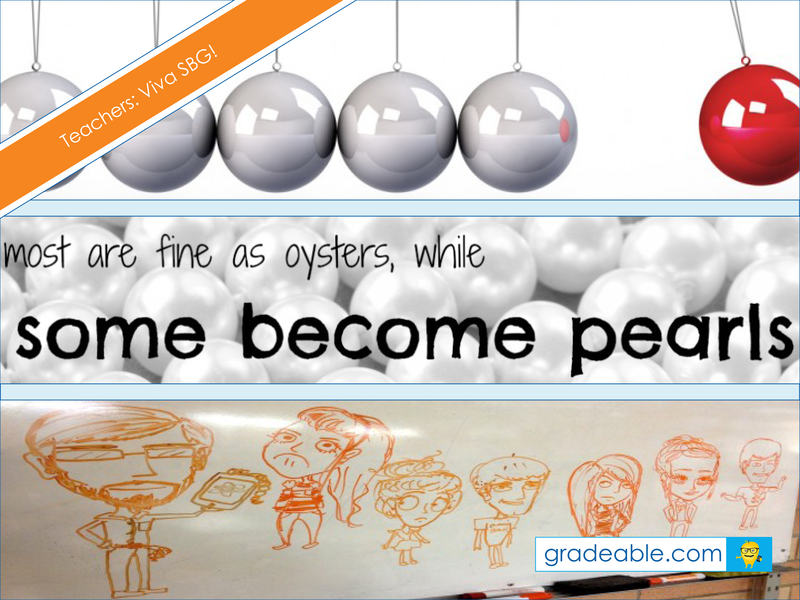 Check us out at www.gradeable.com or say hello at hello@gradeable.com!